The Age of Invention: The finished film. 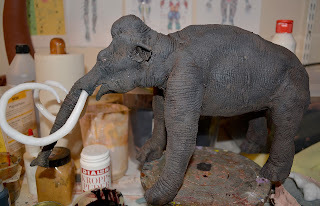 Here's the finished "Age of Invention", warts and all. 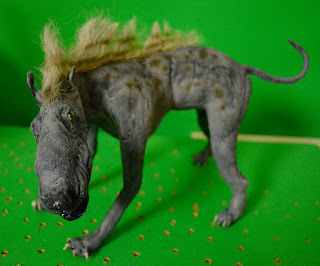 Due to various technical issues and some problems during the filming, it's not as polished as I wished it would be, but I hope you'll enjoy it nevertheless. 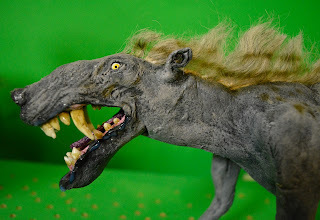 Since all dialogue is in Swedish, it's subtitled in English. 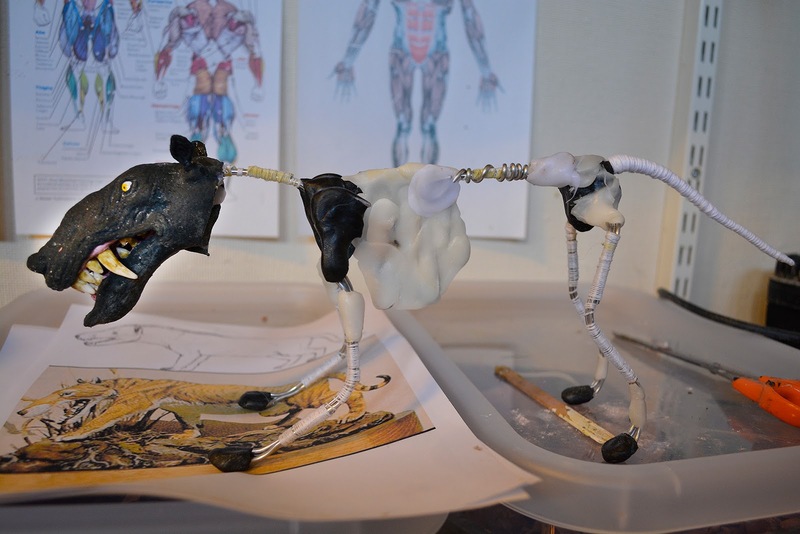 There were only two more puppets in this project, and they're both pretty standard builds. 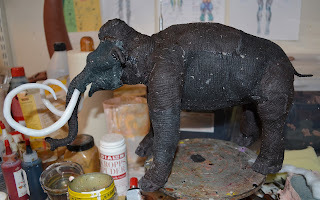 Let's start with the mammoth. I used my preferred sculpting material of medium grade Monster Clay to create the mammoth head. 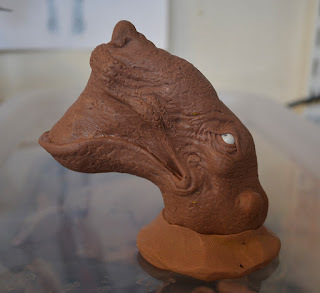 I managed to cast the whole head using a single one-piece plaster mold with a broad open base. this is just before the plaster is added over the sculpture. 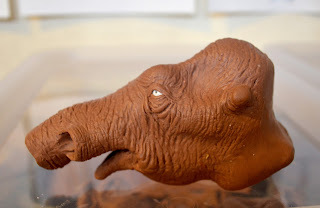 The head was cast as a hollow latex skin. The trunk was build up separately, covering a bit of aluminum wire with soft yarn, and thin polyurethane foam. 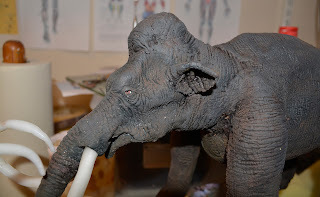 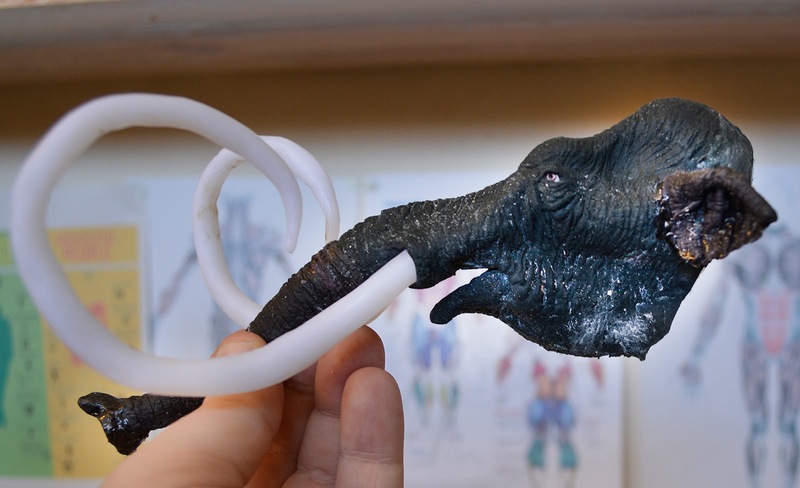 The tusks were shaped by hand from melted Plolymorph thermo plastic. 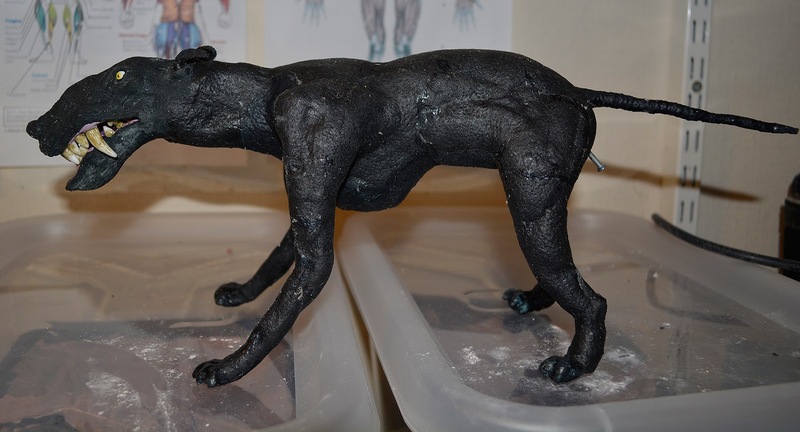 The eyes are round plastic beads painted and covered with a shiny sealer. 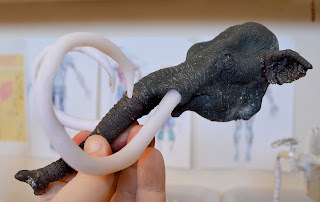 An aluminum wire goes into the lip, and the whole head is lined with the Polymorph, holding together all the jointed bits of the head, as well as giving the latex skin a sturdy support. 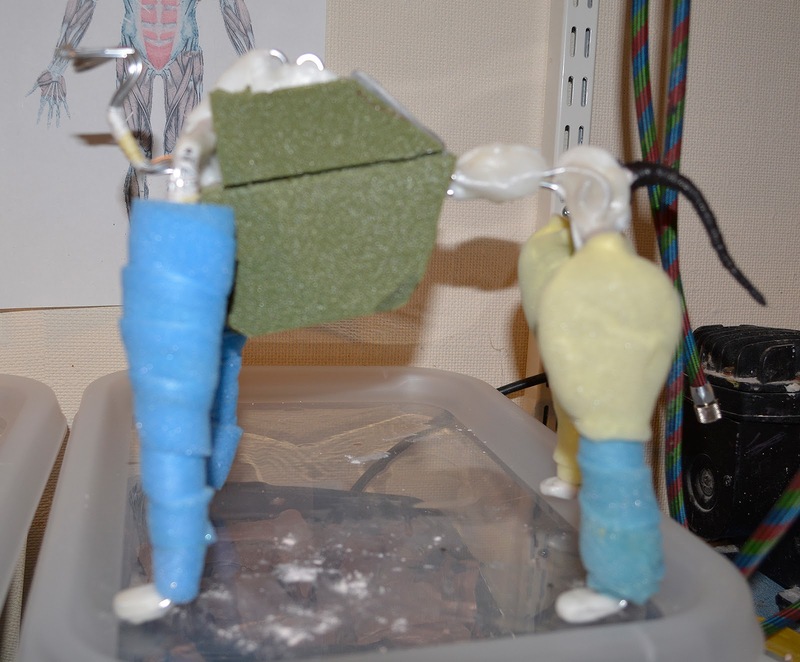 The plastic and aluminum wire armature is given some light weight bulk by using hard foam camping cushions (the moss green material) along the torso and in the legs. 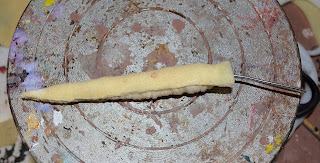 Balls of cotton fills out the belly, but keeps the spine free from obstructive padding, and allows it to be easily animated. 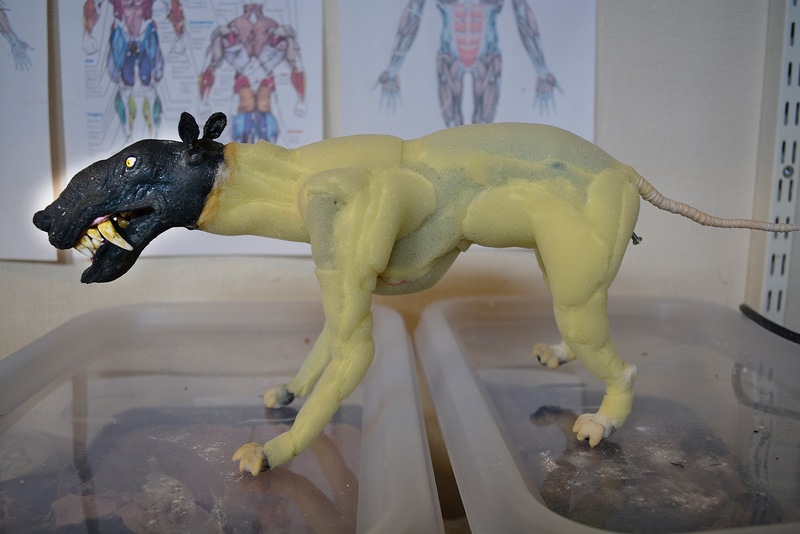 All of the muscles and defined shapes are covered with thin polyurethane foam. 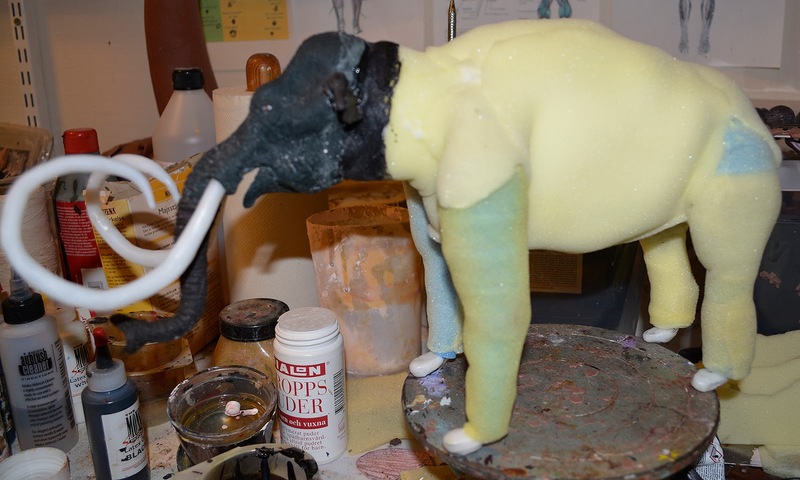 All of the foam is in turn covered with patches of latex skin, cast from a wrinkly plaster skin mold. 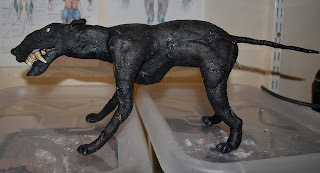 All the latex has been tinted a very dark grey. 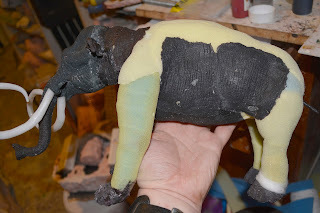 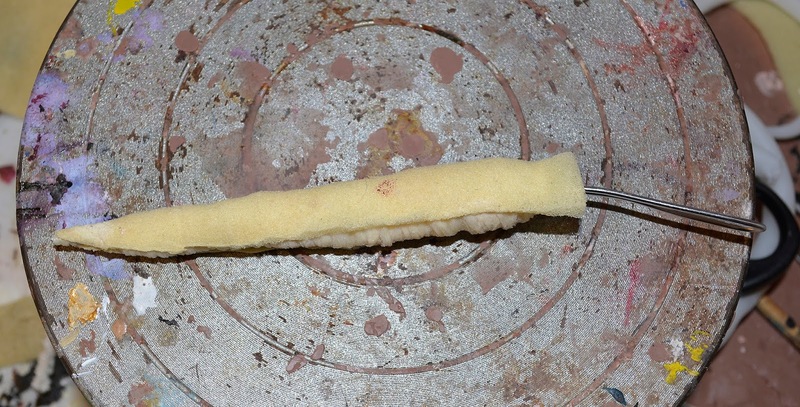 Before adding any fur, the whole puppet is given a unifying coat of paint by drybrushing tinted latex over the skin, leaving some of the deeper wrinkles still quite dark. I decided to make the mammoth slightly shabby-looking, as if parts of the fur was shedding due to hot weather, or something similar. 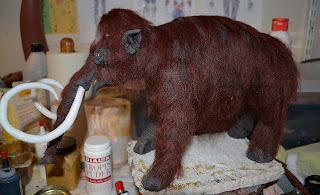 This meant that I couldn't simply add patches of fake or real fur still stuck to fabric or leather. 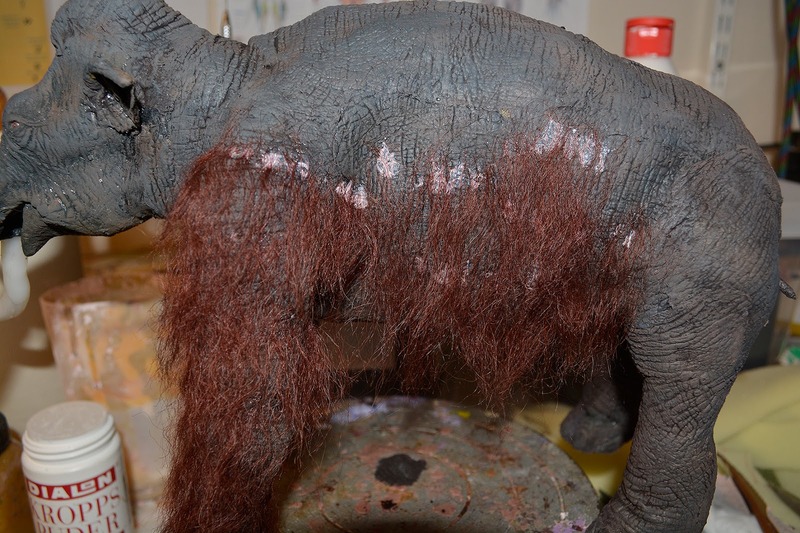 To get the right look I used crépe hair, which is sheep's wool washed, dyed and braided. When the braid is ironed out you get what looks like long strands of hair, which is traditionally used to make fake beards and mustasches for stage productions. 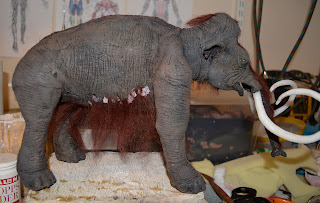 I added tufts of crépe hair to the mammoth skin using liquid latex as a bonding agent- The latex looks milky white hear, but turns transparent when fully cured. 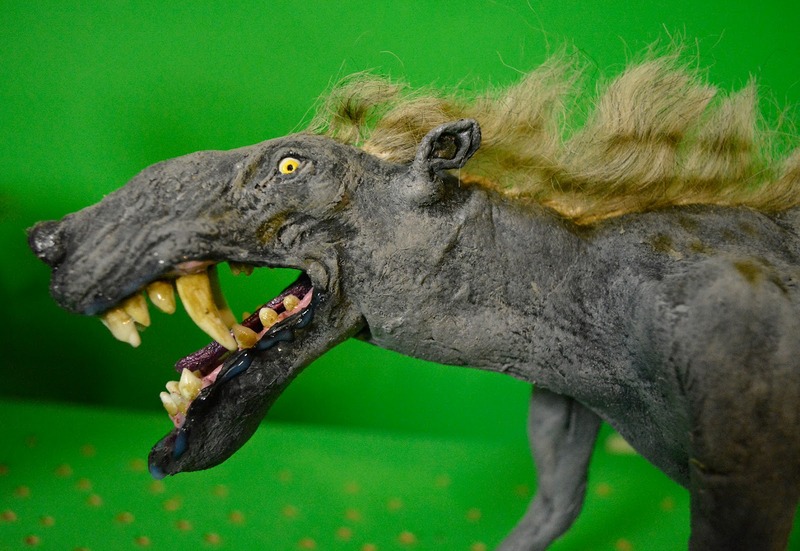 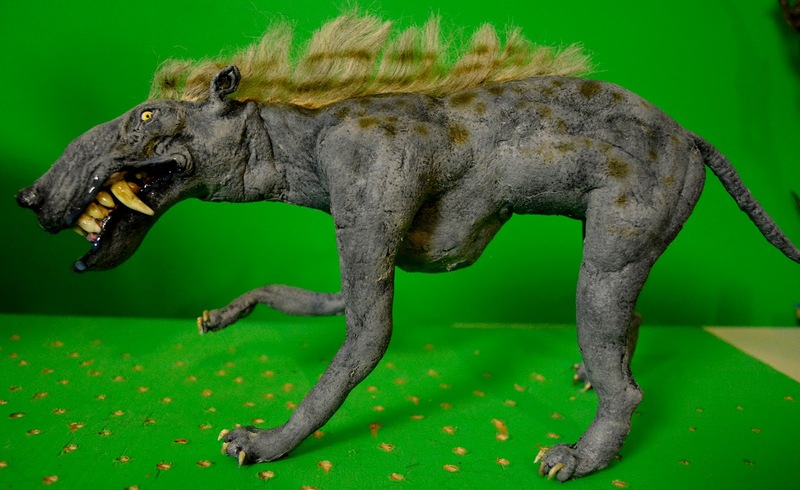 The third and last critter from the film is s dog-like mammalian monster. 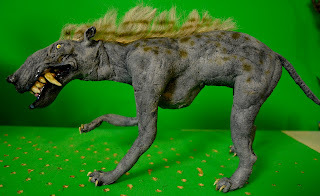 Originally I intended to make it an Andrewsarchus, which traditionally has been portrayed as a giant wolfish creature. 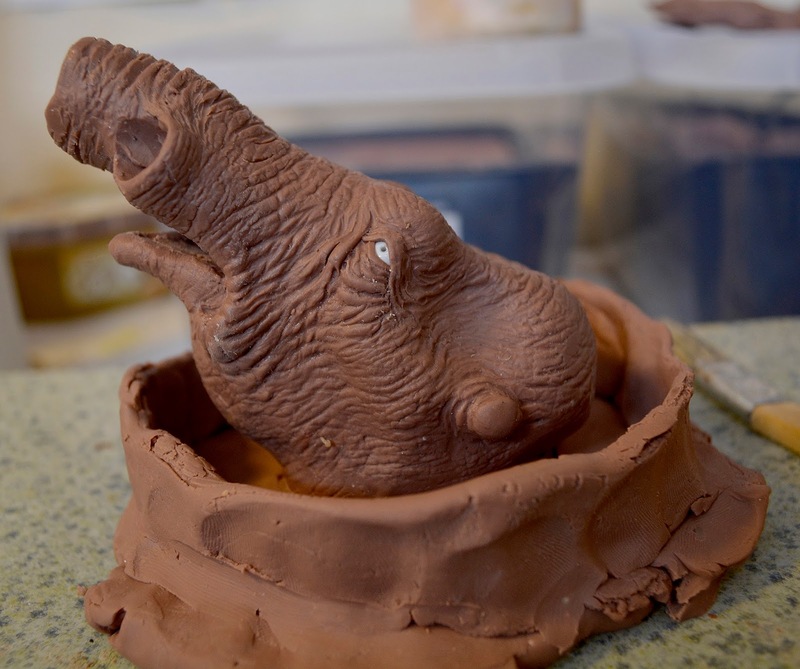 However nowadays I think the palaeontologist reconstruct is as more hippo-like. 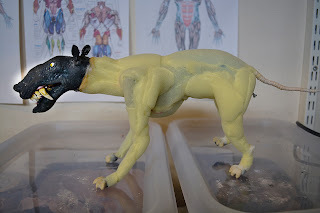 Anyway, when I started sculpting the head to make it more like a weird bull terrier, since I think they're both cool and funny-looking dogs. 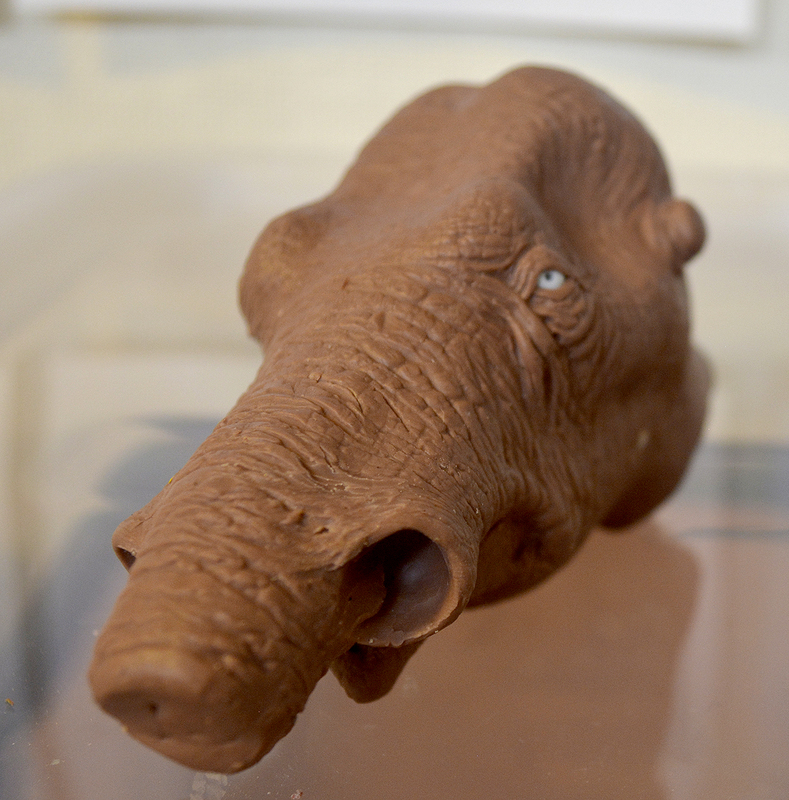 I sculpted the mouth open to get some details between the lips and the gums. 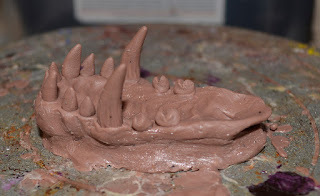 But having the mouth open that wide and also sculpt the inside of the mouth would invite difficulties when making the plaster mold, so I filled it up with clay. Now I could simply create a one-piece plaster mold, as I had done for the mammoth. 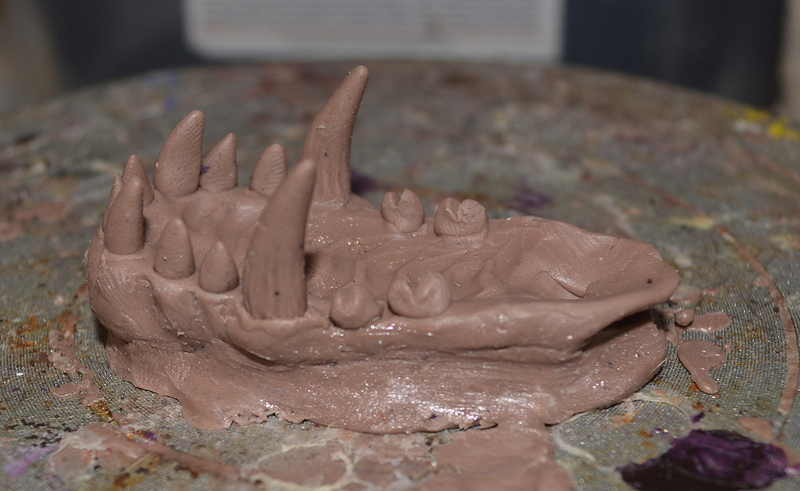 I wanted the teeth to look particularly fearsome, so I decided to sculpt them too. 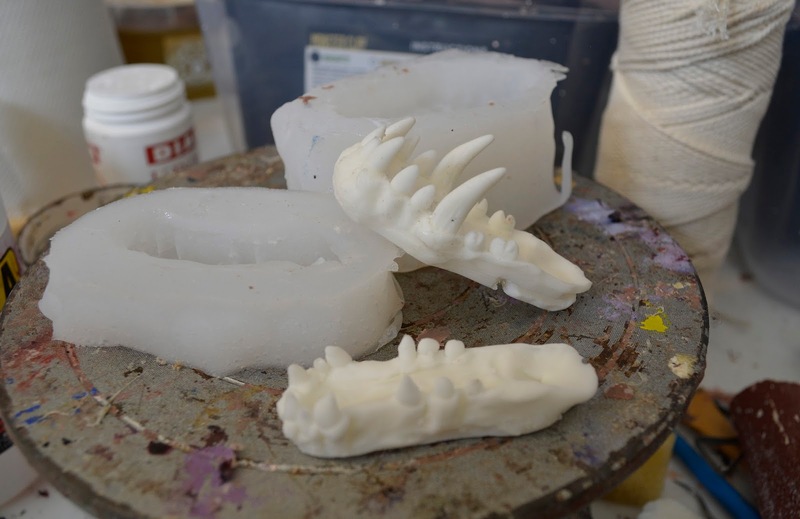 When the top and bottom teeth (with gums) were finished I created two silicone molds over the sculptures, using DragonSkin Pro silicone. Two aluminum wires make up the jaw joint. 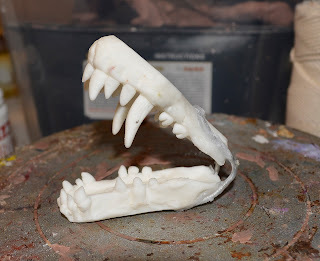 The wires are stuck to the plastic teeth using a mix of super glue and baking soda, which creates a chemical reaction resulting an a very hard bonding material. The teeth are painted with enamel hobby paints and attached to the latex head skin using Polymorph plastic. You can create jointed mouth pieces this way without having to make an entire skull. The puppet is then padded with lots of small bits of soft polyurethane foam, which is covered with cast patches of tinted latex skin. 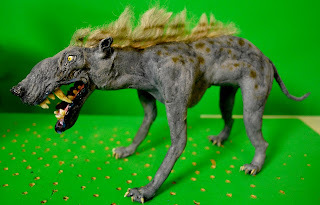 This nameless species of prehistoric canine was given an acrylic airbrush paint job, as well as a crest of blond crépe hair.